Services & Prices Laptop Screen repair and replacement. Laptop Screen repair and replacement. Is your screen cracked? Do the images flicker or is the screen just dark? Does your laptop start up but after a while then fades to black? No Problem! We see this every day. We keep the biggest range of laptop screens in stock, so in most cases we can fix your screen almost while you wait. 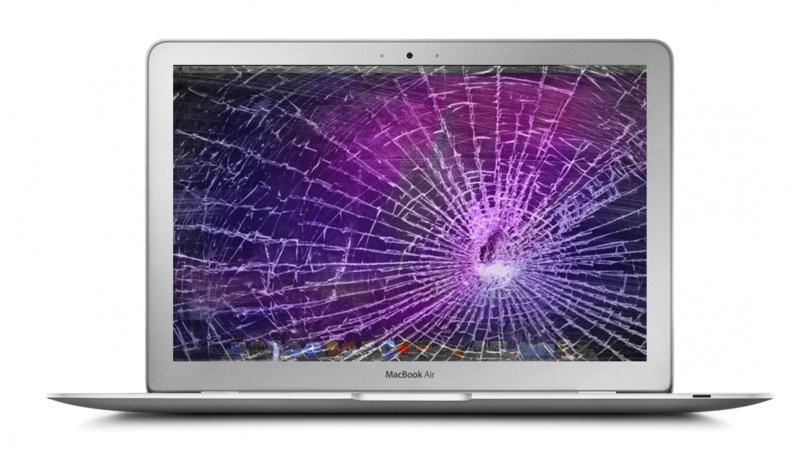 For Apple MacBooks, we are considerably cheaper than the Genius bar for screen repairs too. Our specialists can repair and replace your laptop screen on the same day, also we have a large range in stock of laptop screens from different sizes and brands, meaning that you will have your laptop screen repaired in no time. Sometimes, it’s not the screen that needs to be replaced, but a cheaper part, such as the inverter board or video cable. We’ll find out your exact broken screen issue, in turn, providing the most cost effective, qualified service. We provide screens for all kind of laptops sizes and brands like Sony laptops, Asus Laptops, Lenovo, Intel, Microsoft, Laptop Screen for MacBook Pro, IMB , Toshiba, Alienware, Samsung, HP, Dell and Acer. Screen faults are quite common on many laptops and may not be too expensive to repair depending on the cause. If you can see a very dark or ghost image then the screen has probably NOT failed! The fault is probably caused by the illumination circuitry not working. If there is a display with coloured lines or blocks or no display at all then the fault may lie with either the screen or the motherboard. If the screen has a crack or large blotches or what looks like ink leaking then the fault is probably the screen itself. Contact our office for a FREE no obligation quote... we don't bite! I took my laptop to get the screen repaired at about 9:40 Saturday morning and Arsen replaced the cracked screen with a brand new replacement screen he already had in stock. Wow.. I must of only been in there for 25 minutes... Not even that.!! I will Defo recommend to others.